History, as well as the breed of the cat, plays an important role in determining what is causing the cough. The type of cough is also important. A cough can be moist and productive, meaning that the cat brings up a lot of phlegm and mucous or it can be dry and non-productive. This means that the cat is coughing but isn’t bringing anything up. Despite what many people may think, cats are not just little dogs. Like dogs, there are many reasons why a cat may cough but the cause of the cough may be very different from dogs. It is important to take your cat to the vet if they have a persistent cough. 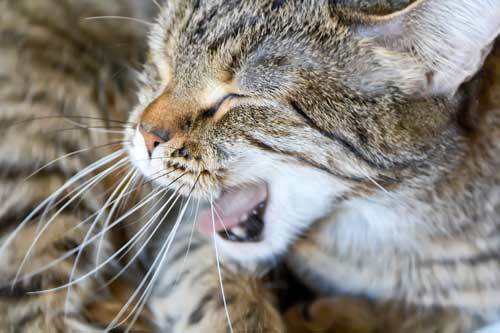 Upper respiratory infections or snuffles and asthma are two common causes of coughing in cats. The respiratory tract consists of the nose, throat, sinuses, windpipe (trachea) and lungs. A cat’s nose, throat and sinuses are susceptible to a number of different viral and bacterial infections. Feline calicivirus and herpes virus are two of the most common viruses causing upper respiratory infections in cats. Both viruses are transmitted through sneezing, coughing, grooming or sharing food and water bowls. The viral infections can be complicated by secondary bacterial infections. The symptoms of snuffles in cats are varied and may include sneezing, upper respiratory congestion, runny noses and teary eyes, coughing, gagging, drooling, fever, a loss of, or decreased appetite, rapid breathing, and ulcers in the mouth. Cats with sniffles may develop conjunctivitis in their eyes; have open-mouthed breathing and they may be depressed. Age, vaccination status and physical condition all play a role in a cat’s susceptibility, but multi-cat households and shelters are most at risk. Cats who have recovered from the viruses may become life-long carriers. Taking your cat to the vet when you suspect snuffles is important. In severe cases, cats may become dehydrated and require intravenous fluids and antibiotics. Some cats may recover by themselves but some may require antibiotics and other medications. Cats should be isolated from others as the viruses are very contagious. Asthma in cats is very similar to asthma in humans and is basically a chronic inflammation of the small passageways in the lungs. These passages become thickened and constrict, making it very difficult for the cat to breathe. The cat may become very distressed, worsening the condition and in severe cases, an asthma attack may result in death. The lungs may release mucus into the airways and this often leads to coughing and wheezing. The most common symptoms of a cat suffering from asthma include coughing, wheezing, difficulty in breathing, open mouth breathing and overall weakness and lethargy. In some cases, cats may develop blue lips, gums and tongue due to a lack of oxygen. It is thought that asthma develops as a result of chronic allergic bronchitis. Allergic bronchitis may be caused by different allergens such as pollens, moulds, dust and cigarette smoke. Parasites, stress and obesity may also be contributing factors. Asthma is most commonly noted in cats between the ages of two and eight years old and it appears to be more common in females than males. Oriental breeds such as Siamese and Burmese cats seem to be more frequently affected. Asthma is diagnosed on a combination of history, a clinical exam and certain diagnostics tests. It is important to rule out other possible causes of coughing. There is no cure for asthma but it can be successfully managed. Other causes of coughing in cats may include a cat which accidentally inhaled dust particles, respiratory parasites, heartworm (which is a disease not currently found in South Africa), tumours in the chest and pneumonia. It is rare that cats with heart failure cough. If it something as trivial as inhaling dust particles, for instance when someone cleans their house and have a curious cat around them when they dust off a very dusty shelf, the coughing should stop shortly after commencing, once the particles have been removed by the coughing bout. Persistent coughing in cats is something completely different and can be an indication of some serious conditions and diseases and so it is very important that a vet examines them. An accurate history and clinical exam are vital in making a diagnosis but often further testing such as X-rays and lung fluid samples may be required. Any coughing that persists for longer than a few hours is a cause for concern and worry and is enough reason to have your cat checked out by the vet.